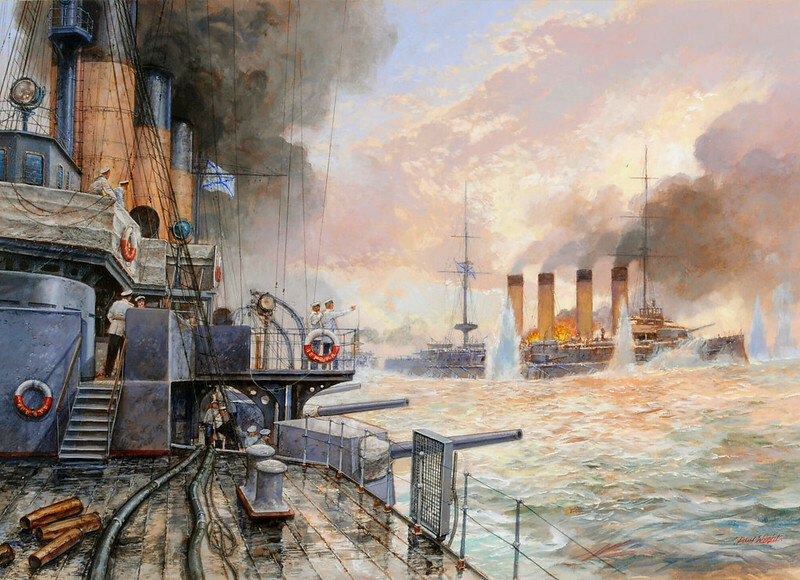 The Battle of Tsushima between the Russians and the Japanese resulted in the greatest naval defeat in one battle in all of recorded history. With their base in Port Aurthur on the Chinese coast threatened by the Japanese army and navy, the Russians assembled a fleet of 40 vessels to sail from the Baltic to the Far East to rescue their colony. This resulted in a fantastic voyage across the worlds oceans only to find that as they neared Port Arthur they learned of it’s fall and so the only course left open to the Russians was to make a dash across the straits of Tsushima to Vladivostock. Instead they were caught by the Japanese Admiral Togo who destroyed or captured all but two of the Russian ships. Художник в отношении своих косячит значительно меньше. Как совсем не знаток французов, может у них есть похожий корабль?